Now that summer is finally here (and it took long enough, amiright? ), we are out and working the grill as much as possible. I love to make more complicated or time consuming grill recipes on the weekend (when we have the time), but we have come to rely on our grill for quick and easy weeknight dinners too. 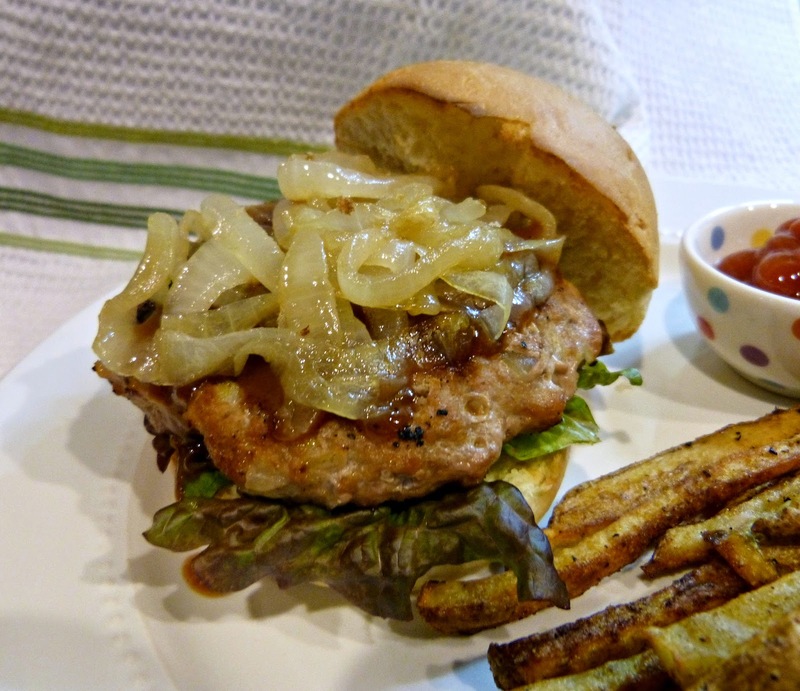 This turkey burger recipe is perfect for weekends and weeknights alike! Turkey burgers get a bit of a bad reputation for being dry and/or boring, and a lot of the time it's well deserved. Turkey burgers can be tricky to pull off-- especially if you're attempting to prepare them like a regular beef burger. By nature they aren't as moist as a hamburger, so it's important to add moisture to them. In this case, sweet sauteed onions and flavorful barbecue are folded into the turkey mixture prior to grilling, locking in some moisture and seriously kicking up the flavor. Topped with a little additional barbecue sauce and some buttery slow cooked sweet onions. The sweet, smoky, and spicy flavor combination is tried and true-- and the perfect way to dress up a turkey burger! Heat a saute pan over medium-low heat and add butter. Once melted, add onions and salt and cook, stirring often, until the onions are very soft and slightly browned, about 30 minutes. Remove onions from the pan and set aside. Return pan to medium heat and add olive oil. Add garlic to the pan and saute for 2-3 minutes until soft and fragrant, but not browned. Take 1/4 of the cooled cooked onions and finely dice. Add to a medium mixing bowl along with cooked garlic, turkey, 2 Tbs. barbecue sauce, and salt and pepper, to taste. Combine all ingredients to fully incorporated. Divide the mixture in half and form into two evenly shaped patties. Grill for 8-10 minutes on each side until burgers are completely cooked through. Arrange lettuce on the buns and top with burgers, cheese (if you want it), remaining barbecue sauce, and caramelized onions. Serve immediately.